If you’re anything like me then your breakfast inspiration may be slightly lacking. I eat varied and well, but my breakfast almost always consists of a super-green smoothie because I’m short on time in the morning. This seems to be what my body wants most days, and it gives me a great burst of nutrients and energy which I love, but sometimes I want something a little more interesting, particularly on weekends when I have more time and want to get creative. 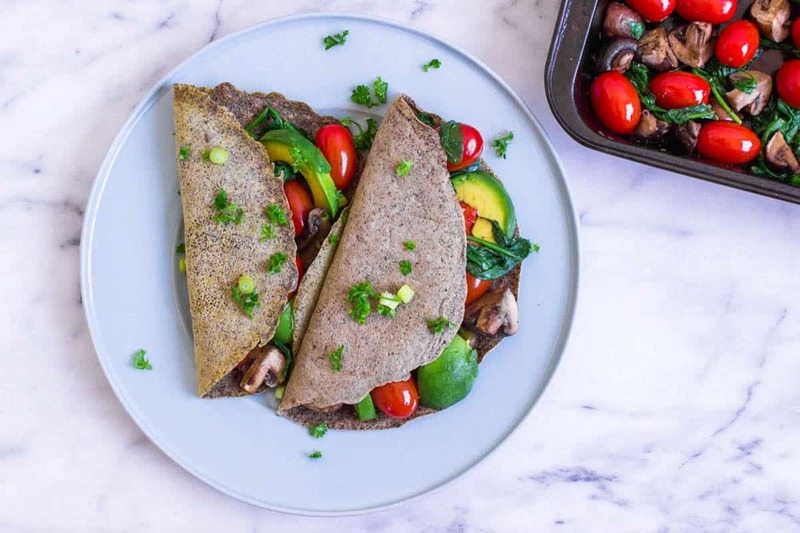 These Vegan Breakfast Crêpes are great because they’re pretty easy to make and the whole batch takes about 45 minutes start to finish. The chickpea flour and mushrooms provide protein, while the tomatoes and spinach give you a dose of vitamin C and iron. Whilst I personally find them a bit too heavy to eat every morning, I love having them as a leisurely weekend breakfast. Once you’ve got the hang of making them they’re pretty low maintenance, which means you can make a double batch to have with friends and not be completely stressed and red in the face while making them and trying to hang out at the same time! Try to serve the vegan breakfast crêpes as soon as you can after making, or keep them warm in the oven while the remaining ones are cooking. The whole dish (veggies and all) tastes better the hotter it is, so try not to allow it to get cold before you serve it. I quite like to cook all the crêpes and keep them on a plate in a warm oven, then serve everything at once by placing the crepes, hot roasted vegetables and any other toppings/garnishes on the table and letting everyone make their own. This saves on assembly time and means everyone gets their food while it’s hot! Preheat the oven to 400°F/200°C. In a large mixing bowl use a hand whisk to mix all the dry crêpe ingredients together. Add the water and whisk to a smooth consistency. Set the mixture aside for 10 minutes. While the mixture is thickening place a frying pan on a medium-low heat. Use kitchen towel to brush oil lightly around the surface. When a drop of water sizzles on the surface of the pan, it’s hot enough. Pour ⅓ cup of crêpe mixture into the frying pan, moving the pan around to ensure that the mixture coats as much of it as possible. Cook for 2 minutes or until the mixture is no longer liquid and is peeling away from the sides, then flip it over and cook for a further 2 minutes. Repeat these steps with each crêpe until they are all cooked, storing the cooked ones in a warm place. While each crêpe is cooking you’ll have a few minutes of downtime to prepare the filling. Place the tomatoes, mushrooms and garlic on a baking sheet, tossing them all together. Brush them with the olive oil and season well with salt and pepper. Roast in the oven for 10 minutes. 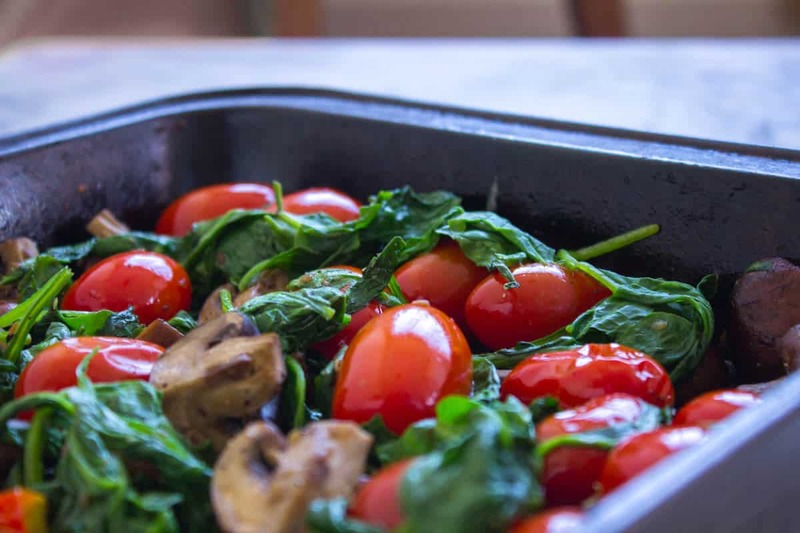 Remove, add the spinach to the baking sheet on top of the other vegetables (it will look like it’s too much but don’t worry, it will decrease in size) and bake for a further 5 minutes (just enough time to allow the spinach to wilt). Remove the tray from the oven. By this time your crêpes should nearly all be cooked and you can start assembling them. 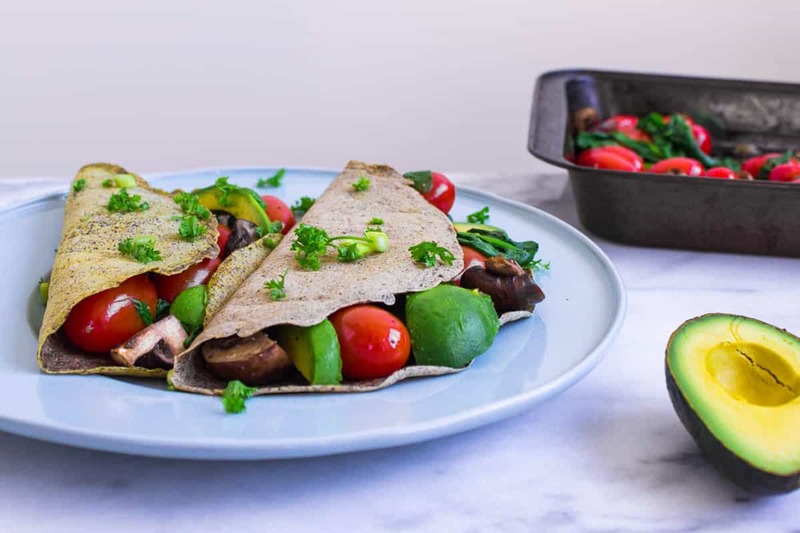 Place a large serving-spoonful of the vegetable mixture, some slices of avocado and a squeeze of lemon juice on one side of each crêpe, adding more salt and pepper if you need to. If you wish to use cheese, add it now. Fold the crêpe in half, garnish it with parsley and green onion slices if desired and enjoy.